Elevator and escalator accidents are surprisingly common—and devastating. These accidents can cause serious and life changing injuries in seconds; however, they don’t malfunction for no reason. Usually it’s because they were adjusted incorrectly, weren’t serviced properly, or the required inspections weren’t performed. In other words, most elevator and escalator accidents happen because of negligence from those responsible for them. Every New Yorker has had a nightmare about being trapped in a falling elevator. In the real world, elevator accidents almost never involve a free fall. Elevators are outfitted with multiple safety features so they cannot simply fall down the shaft. Real elevator accidents are usually much more subtle, but can still be very dangerous. The most common elevator accidents are known as “misleveling.” When an elevator mislevels, it doesn’t line up with the floor properly. This can be by as little as a few inches; however, that is still enough for you to trip on your way out. This can lead to injuries such as a broken wrist, sprained ankle, head injury, broken teeth, or other very serious injuries. Elevators don’t mislevel on their own. They mislevel because someone made an improper adjustment. Another common occurrence is elevator doors staying open while it is moving. This is also a result of error from maintenance personnel. It’s an extremely dangerous situation. Some of New York’s worst elevator accidents have involved an elevator taking off with the door still open. Escalators are surprisingly dangerous machines. They’re among the few devices from the 1800s that are still pretty much unchanged today. Most accidents involve getting something caught in the escalator. 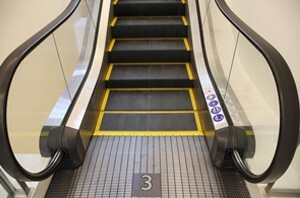 For example, a woman’s dress can get caught where the stairs disappear at the top or bottom of an escalator. This is very dangerous because the escalator will just keep moving. Children wearing sandals have lost toes by getting caught. Because escalators are so dangerous they should be equipped with safety features. At a minimum this involves clearly marked emergency shutoff switches within arm’s reach of the top and bottom of the stairs. Unfortunately many New York escalators lack these features. These accidents are what the legal profession calls “res ipsa loquitur.” This Latin phrase means the accident itself is proof that somebody didn’t take the proper precautions. It couldn’t have happened unless someone was negligent. If others reported that the elevator was acting weird before you had your accident, the building manager knew there was a problem. They should have addressed it. If the building manager didn’t keep up on elevator inspections or didn’t install the necessary safety equipment on an old escalator, then they caused the danger themselves. If either of these conditions are met, then the owner or manager of the building is responsible for the accident. That means you can collect compensation to help pay for medical bills and missed work. Steven Weinstein has 30 years of experience as an injury lawyer and has worked on numerous elevator and escalator injury cases. When you ask The Weinstein Law Group, PLLC to represent you, we’ll work tirelessly to secure the money you need and to make the party responsible pay for their negligence. We gather every detail possible. Steven is known as a thorough lawyer with a sharp eye for detail. If evidence exists, he will find it. We listen to you and treat you with respect. Your attorney is your advisor: you’re trusting us to help you get your life back on track. We will return your calls promptly, answer every question you have, and keep you informed at every stage of your case. We charge you nothing unless we win you money. We don’t believe you should have any more bills when you’re already dealing with a major injury. If we don’t get you a successful verdict or settlement, our work is free. How do you know if you have a case? The only way to find out is to talk to a lawyer. The Weinstein Law Group, PLLC offers a free, in-depth case analysis and consultation. We’ll help you understand your case so you can decide if you want to go forward. Call us at 212.741.3800 or contact us online and get your free consultation today.